Though I can’t say I’ve got over my term one fatigue just yet, I feel I have my cooking mojo back at long last. Thank heavens. I’ve been staring at the same squash and the same block of halloumi for weeks now and have had absolutely no idea what to do with them at all. Then yesterday (my 32nd birthday – not 33rd as I’d thought!) I got Nigel Slater’s new book, Tender, and ideas/inspiration came flooding back. Haven’t actually made anything from Tender yet but I’m very thankful Mr S for getting me out of the rut with his consistently gorgeous recipes and ever soothing chat. Cut the halloumi into 1 cm thick slices and place on a piece of tinfoil which has been shaped into a tray (edges folded over and up). Whisk the honey, oil, thyme and pepper together and brush thickly onto the slices. Bake for 10-15 minutes until the cheese has just began to colour. As usual, this dish looks delicious! happy birthday wendy. It made me smile to read you were a year younger than you thought. I hope the discovery made you smile too! All this inspiration flying around wonderful blogs… I’m gonna have to go out and get some halloumi now you’ve reminded me how much I like it. It’s called squeaky cheese in our house. I’ve cooked haloumi on *many* occasions, but I’ve never baked it. Moreover I’ve never baked it with honey. Am really intrigued by this Wendy. Sounds a bit like a baked ricotta dish a local cafe used to make – ricotta baked with honey, lemon juice, thyme and rosemary. Was absolutely delicious. And isn’t Tender fabulous – I’m loving reading through my copy. Congratulations on getting your mojo back! I adore halloumi and eat it often but I’ve never baked it. I give it a few days before this is on my plate. I’ve got Real Fast Food too but never noticed it. Halloumi is one of my favorite cheeses. I usually have a block in the freezer in case the craving hits me. Lovely preparation! Oh, now I haven’t thought of adding honey and herbs to Halloumi. That sounds really scrummy! I do love Halloumi. I will have to try this method. Note to self – buy Halloumi on next visit to Tescos. Will go perfectly with some Lamb for a Greek twist! Happy Birthday too! Usually grill halloumi, so must try this! I love the squeakiness when you bite into it. Bought some hallumi yesterday and going to try your recipe this evening. Thanks! The hallumi last night was great! Thanks so much Wendy! I just loved the honey flavour. Will definately be doing it again soon! I read you blog last week. I like your blog. I had the cheese yesterday in batter as an alternative to fish and chips, it was on menu as Veggie fish n chips, and was gorgeous! 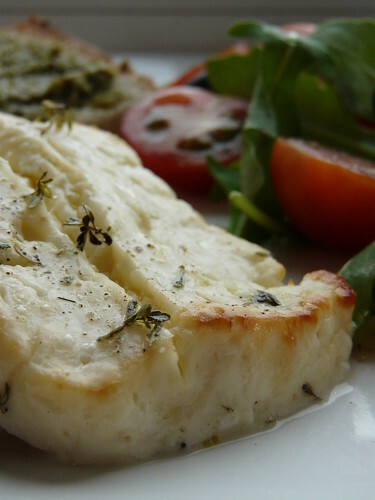 I love halloumi cheese, any other ideas how i can use it in recipes? If it’s squeaky you’ve over cooked it! Nice recipe, my other half will love this (she’s a struggling ex-veggie). This looks lovely, I really like Halloumi in a curry, it goes really well. Great blog too, well done! This sounds delicious. I usually pan fry my halloumi, which can be a bit hit and miss. Definitely going to give this a go. Halloumi is amazing! I discovered it way too late in life! I was at a BBQ the other week and people were grilling it so I took a piece not realising it was a massive piece, but as I looked around I saw no-one else was looking so I just kept the whole piece, naughty! I’ve been staring at the same squash and the same block of halloumi for weeks now and have had absolutely no idea what to do with them at all. Then yesterday (my 32nd birthday – not 33rd as I’d thought!) I got Nigel Slater’s new http://www.garciniacamboslim, Tender, and ideas/inspiration came flooding back. it sounds like a perfect getaway! Your photos are too good – and I haven’t ever tried halloumi before – it sounds like quite a wonderful experience.